Portable, hand-held sharpener to address straight and curved edges in one! Easy slide release to access sharpeners stored in convenient enclosure that is 5 1/2" x 1 1/2" x 13/16" and includes: Straight edge sharpener 4.33" x 0.875" surface and serrated 4.44" with 0.25" to 0.0625" diameter taper. 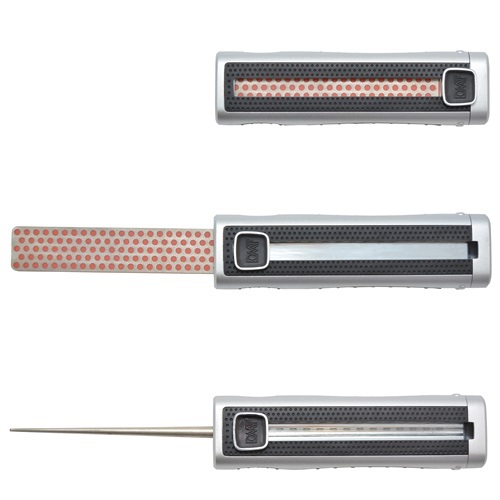 Both sharpeners in fine diamond (red/600 mesh, 25 micron) for a razor sharp edge. Sharpeners made in USA; other components made in China. Portable housing for two sharpeners for easy storage and carry at 5 1/2" x 1 1/2" x 13/16"